Avocado stuffed with crabmeat and topped with vinaigrette dressing makes a delicious entrée for a gourmet luncheon, or an elegant appetizer course for a seafood dinner. The creaminess of the avocado combines beautifully with the sweetness of crab, while the vinaigrette provides a tangy balance to the star ingredients. Simple to make and artistic to look at, a crab and avocado salad satisfies the taste buds of even picky diners. Avocado stuffed with crabmeat is a simple preparation; choose high-quality ingredients to make your dish stand out. The creamiest avocados are the dark skinned, pebbly California Haas variety. To choose an avocado at the perfect stage of ripeness, gently press on the skin with your thumb. It should have some give, but not be mushy. Inspect the avocado for dark skin and a plump appearance. Avoid shriveled fruit or fruit with sunken spots. Additionally, avocados with a slight neck rather than a rounded top were most likely tree-ripened, yielding better flavor and texture. Place under ripe avocados in a brown bag for a few days to ripen. While you could purchase a pre-made vinaigrette, making your own is quite simple. A traditional vinaigrette contains a three to one ratio of oil to vinegar or another acid, such as lemon juice. You may also opt to add herbs to brighten your vinaigrette. Crab meat needs a lightly flavored vinaigrette; use a vinegar such as sherry or white wine vinegar that will not overwhelm the delicate flavor of the crab. Try a simple sea salt and fresh cracked black pepper seasoning, or toss in some fresh tarragon, which has a light anise flavor that pairs beautifully with the sweetness of the crab. Once you've selected the perfect ingredients, it's time to put it all together. Try this simple recipe, or create your own variation. Place avocado halves on a small salad plate. Mound crab meat in the avocado centers, where the pits were removed. Whisk the remaining ingredients together, tasting for seasoning. Drizzle vinaigrette over the crab and avocado. Serve immediately with a crusty French bread and a crisp glass of Chardonnay, Champagne or a crisp German Riesling. Many people feel that the combination of crabmeat and avocados is nearly the perfect blend of flavors. 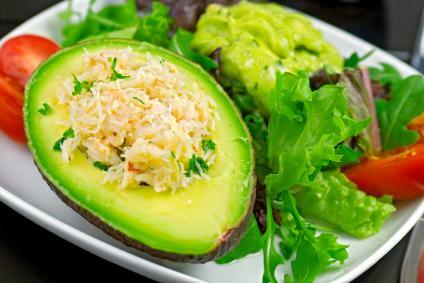 The buttery texture and taste of the avocado provides the ideal counterpoint to sweet crab and flavorful vinaigrette. Once you know the basics for making this simple but delicious dish, introduce slight variations that provide you with new flavors every time you make it. Try this at your next luncheon; it will become one of your go-to entrées whenever you entertain your friends and family.